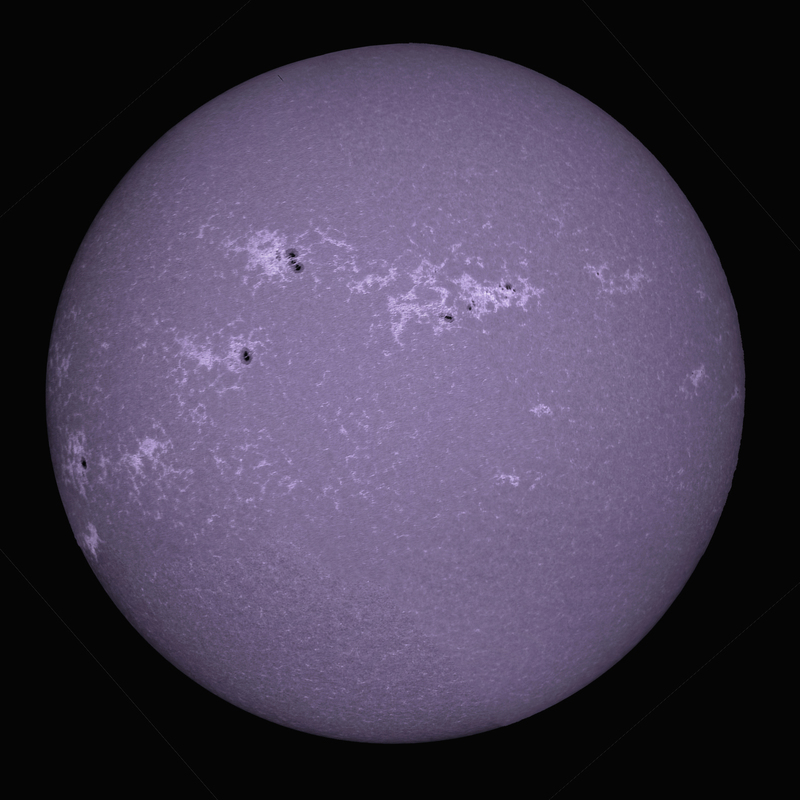 The image on the left is a 5 panel solar mosaic in Calcium K taken today with my Equinox 120ED scope and a Lunt B1200 CaK module. 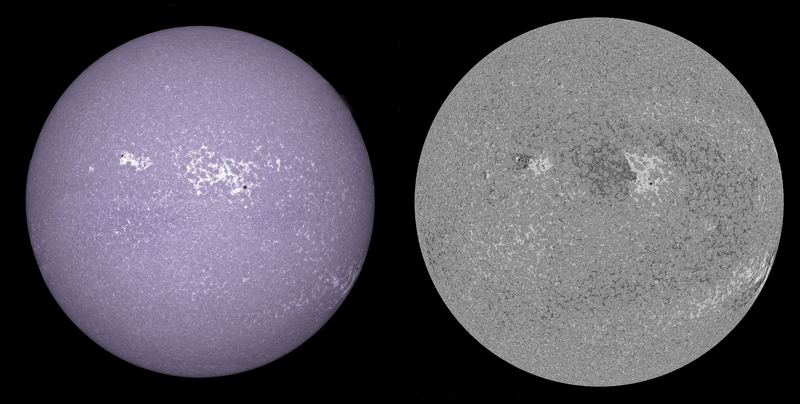 The image on the right is a magnetogram from NASA’s SDO satellite in orbit around the Sun. 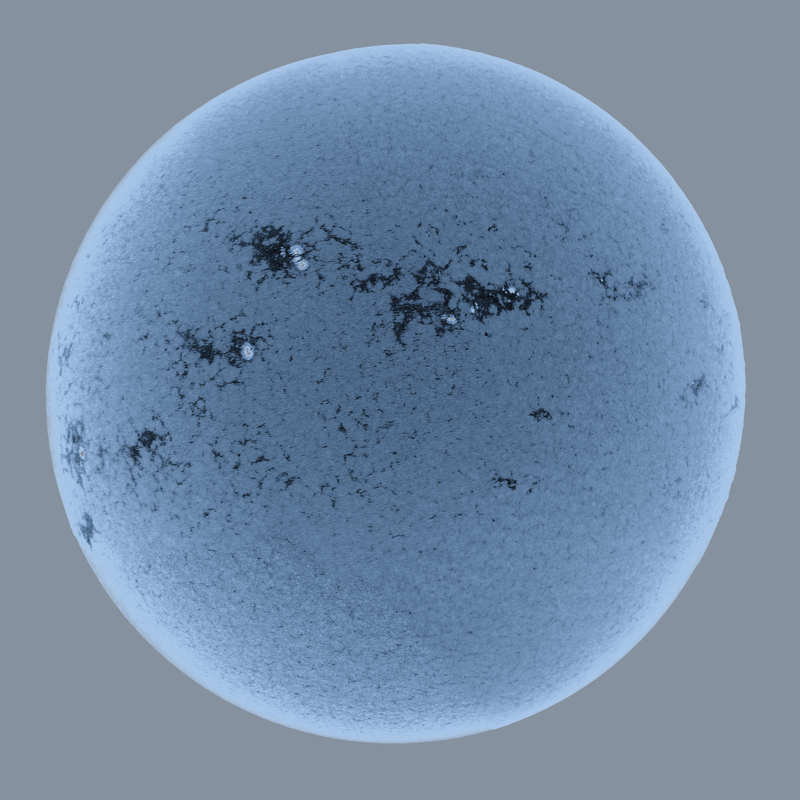 AR 2386 was the only discrete group clearly visible today, there was one smaller scattered group (out of shot to the left) and another just disappearing on the limb (far right here) but AR 2386 was well placed for imaging. 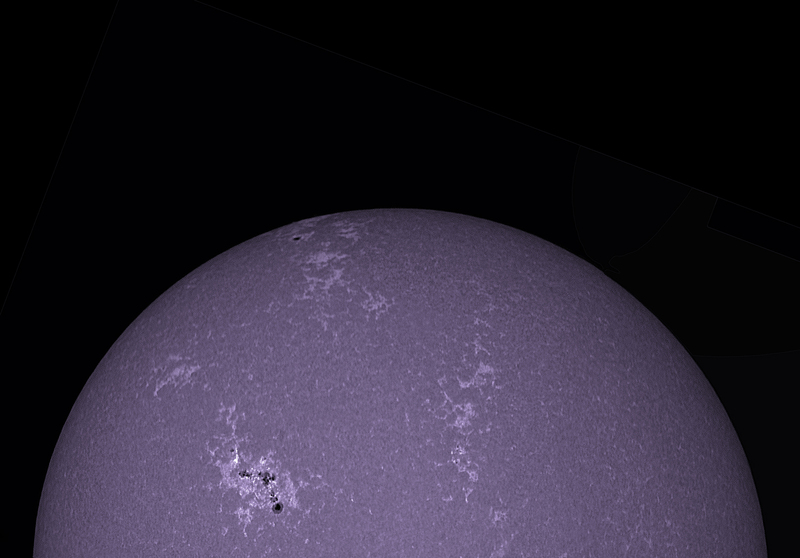 H – A visually unipolar sunspot group with penumbra. s – small, symmetric. Largest spot has mature, dark, filamentary penumbra of circular or elliptical shape with little irregularity to the border. 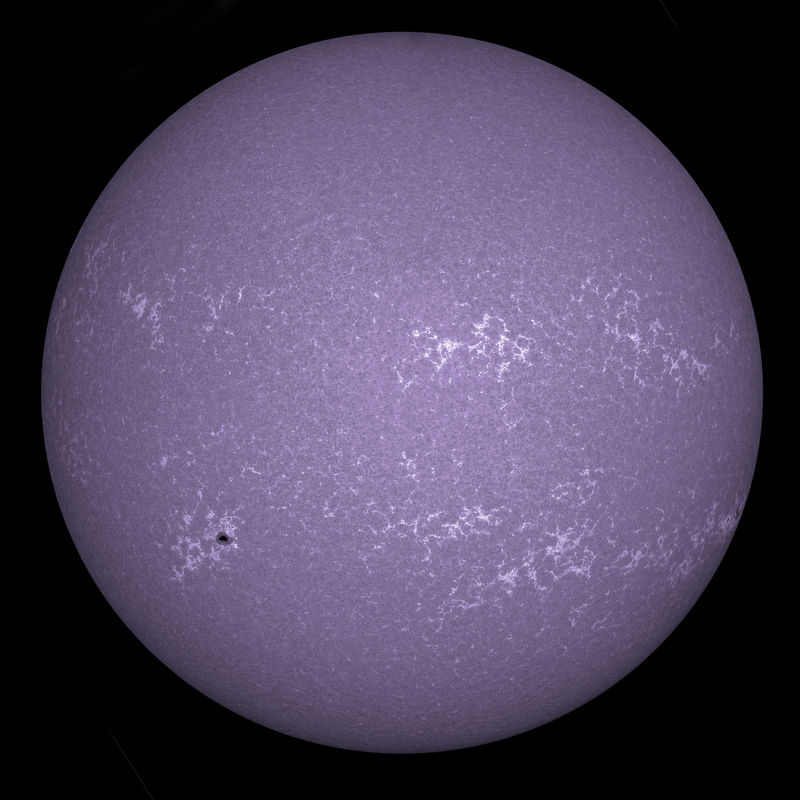 The north-south diameter across the penumbra is less or equal than 2.5 degrees. x – undefined for unipolar groups. 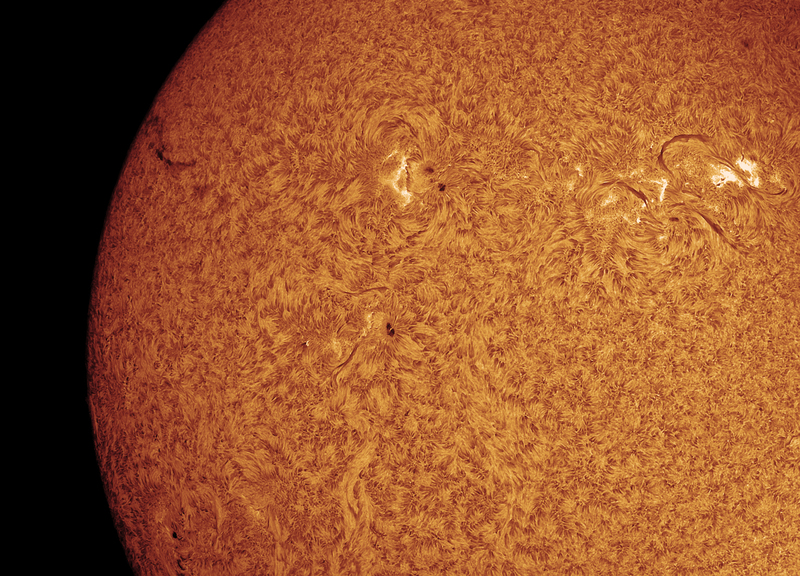 Using a x3 Barlow, I got a nice image of the main sunspot with a light bridge, penumbral filaments, surrounding pores and a good background full of granulations. I’m always bothered by dust spots on my images so I cleaned my Skyris CCD sensor and 3 xBarlow lens with a hand blower and then an Arctic Butterfly static brush which seemed to work very well with minimal dust on my zoomed in image. 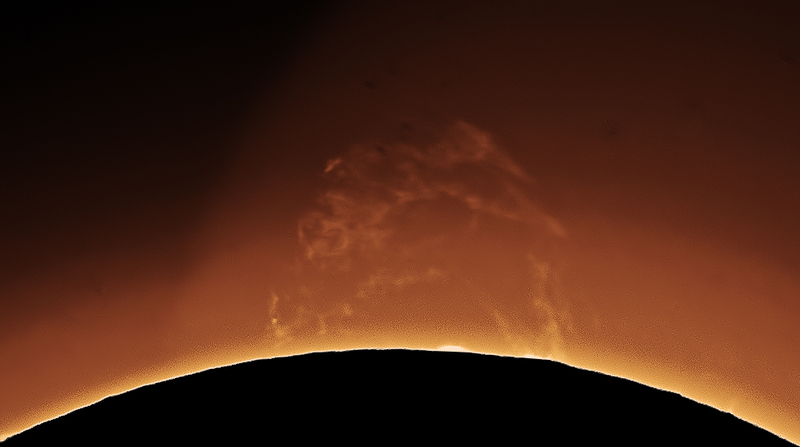 A floating arch prominence in Calcium K.
Calcium K full disc 8 panel mosaic. 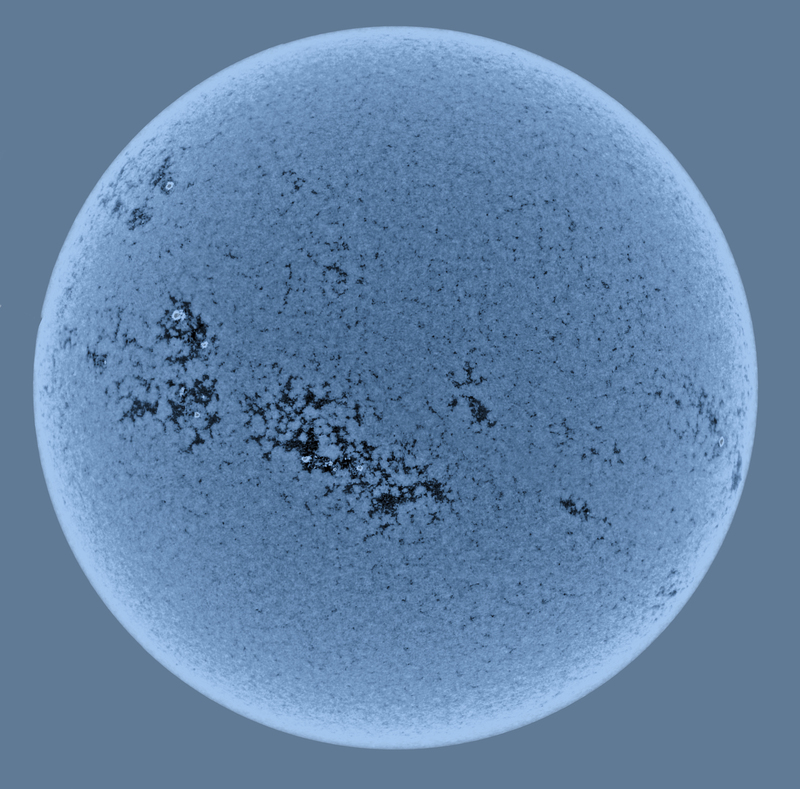 Single 2000 frame video of white light (false colour) Sun. 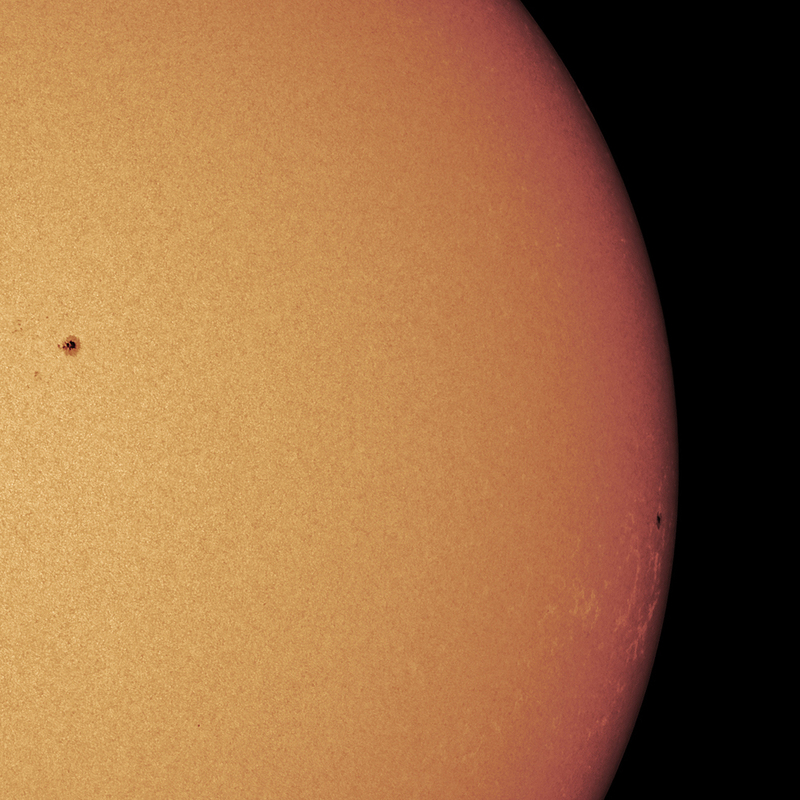 2.5 x Powermate magnification of sunspots. 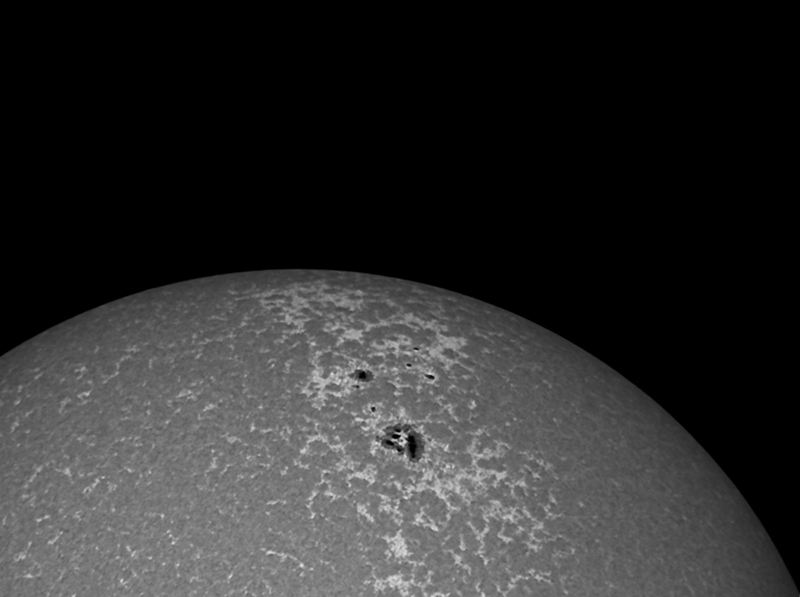 Hydrogen alpha image of main sunspots. 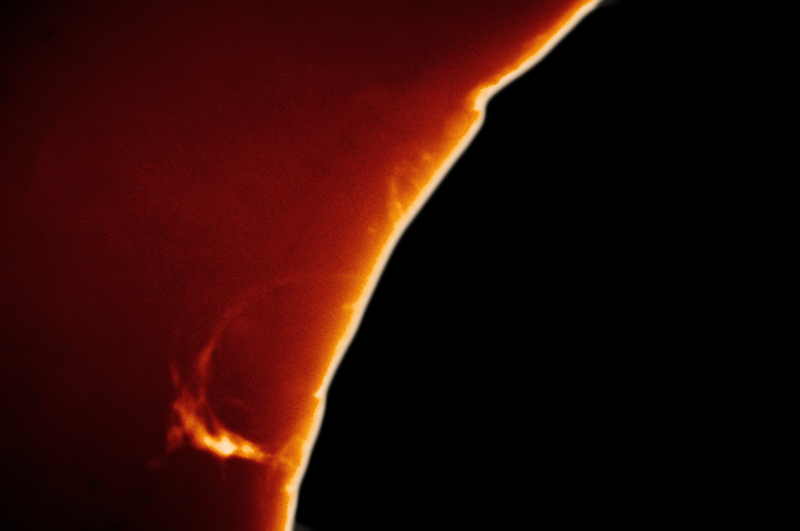 Today’s Sun imaged in Calcium K. the top image shows a nice pair of loop prominences – certainly, the largest loop that I have imaged in CaK. 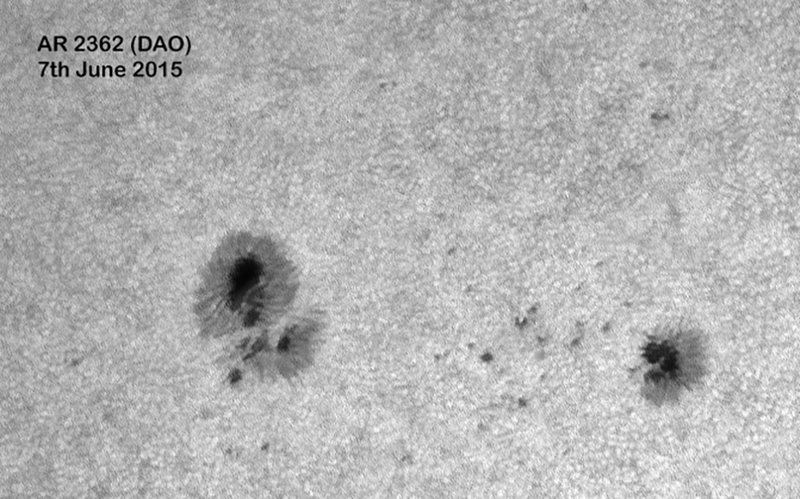 The middle panel is a mosaic made of 7 separate smaller panels and the bottom image is a single panel showing Active Region 2209. 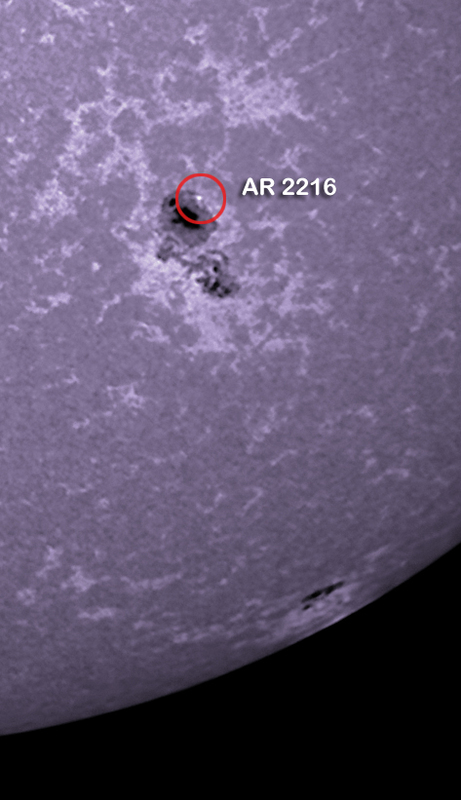 A little micro-flare (or an Ellerman bomb) was visible at the edge of the penumbra of AR 2216 – red circle (click to enlarge). 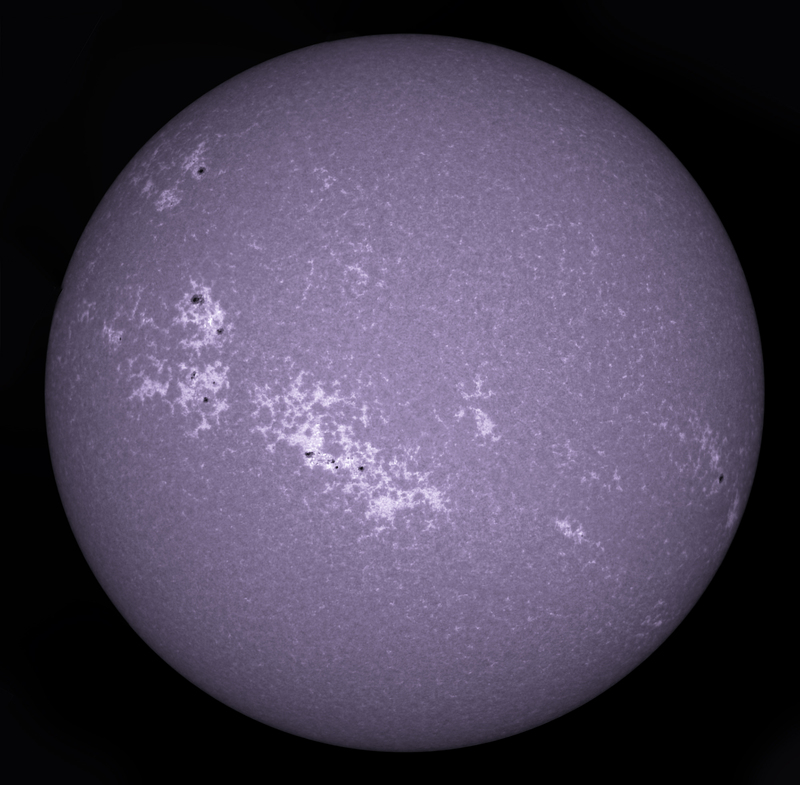 Celestron Omni XLT 1000/102mm scope on Ioptron ZEQ25GT mount with astroHutech Hinode guider. 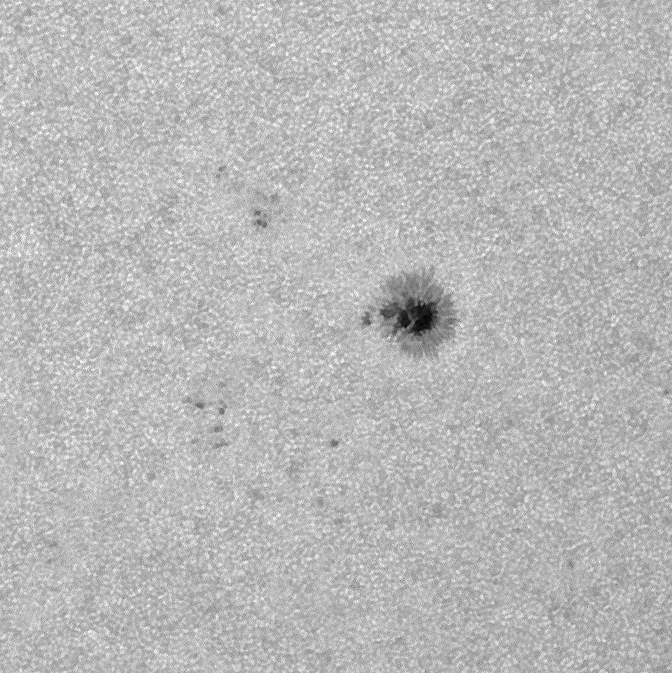 Lunt B1200 CaK module with Baader K-line filter. 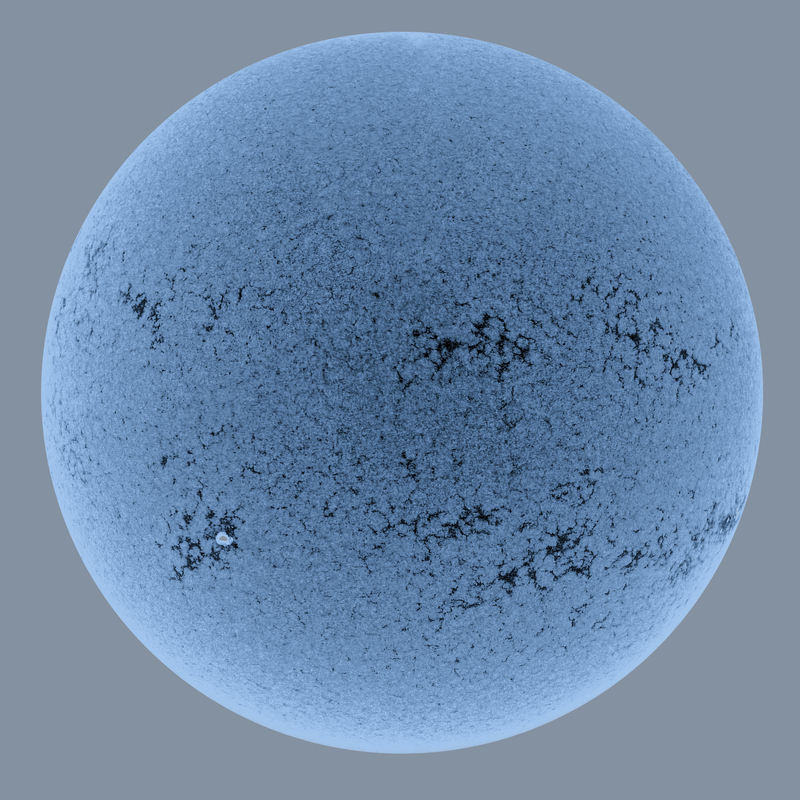 Skyris 273m CCD camera with video files processed in AutoStakkert 2/Registax 6.0 and Photoshop CC. 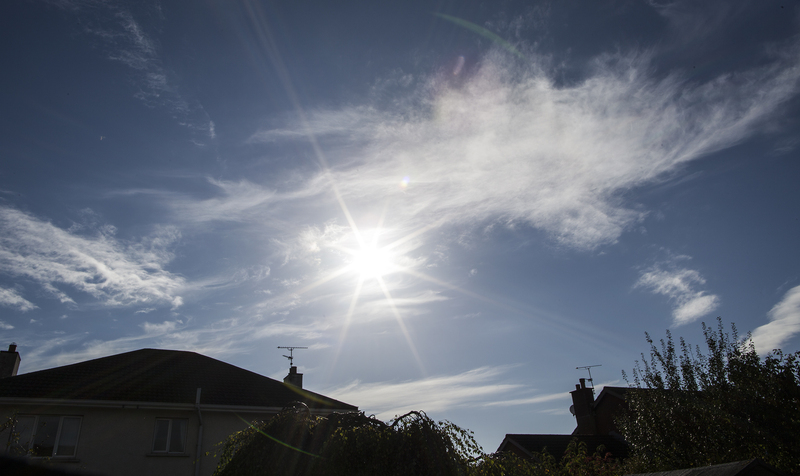 The hazy cloud didn’t clear until late afternoon when the winter Sun was quite low. There then followed the somewhat comical sight of me taking a couple of mosaic panels then moving everything to another part of the garden as the Sun did its best to sink behind trees and neighbours houses. 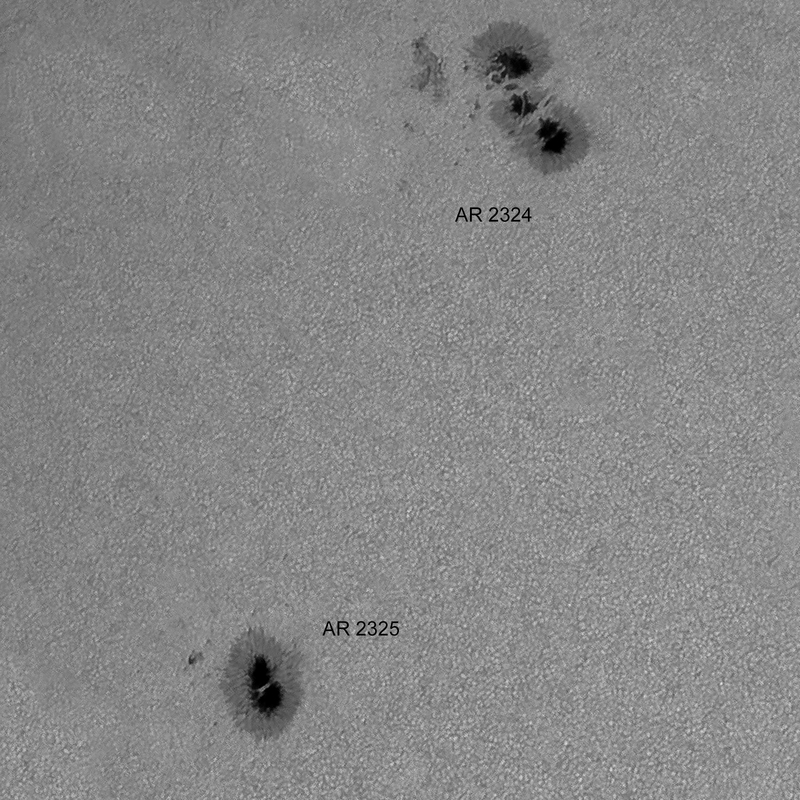 The large AR on the left is AR 2205. 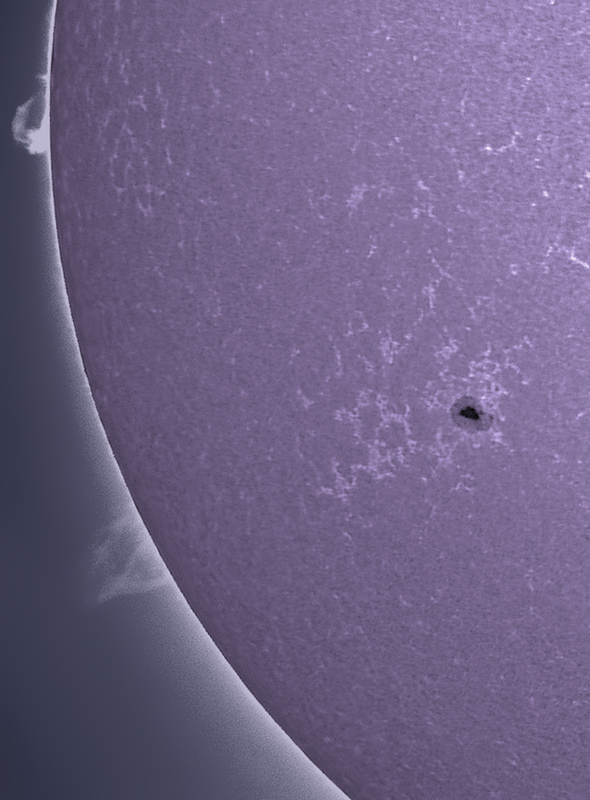 Celestron 1000/102 Omni XLT with Lunt B1200 Ca K module, Baader K line filter and Skyris 274m CCD camera. 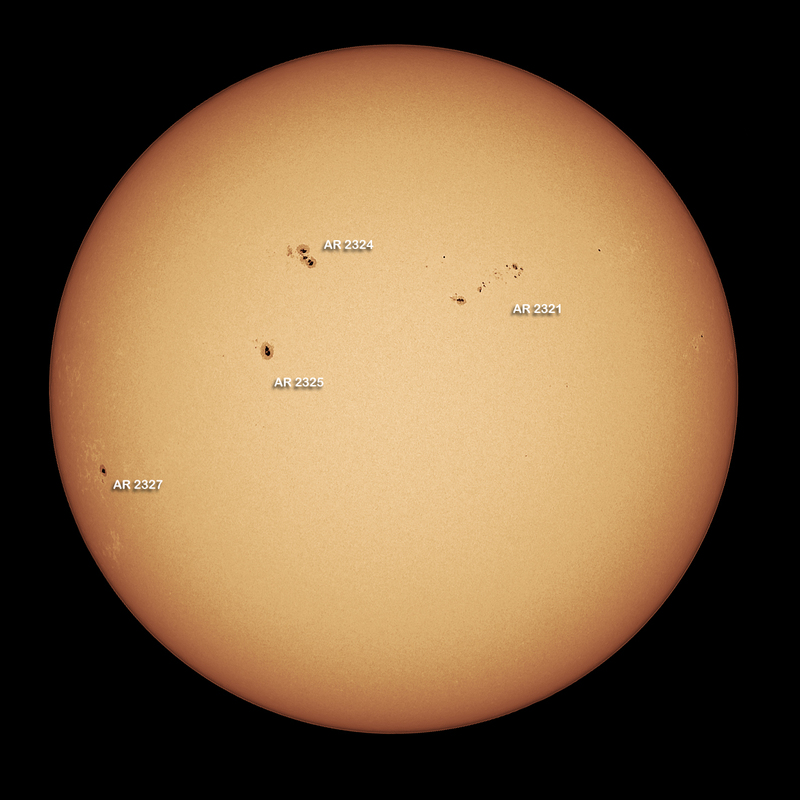 8 panel mosaic of solar disc showing 1. sunspots, plages and arch filament footpoints and 2. chromospheric network. 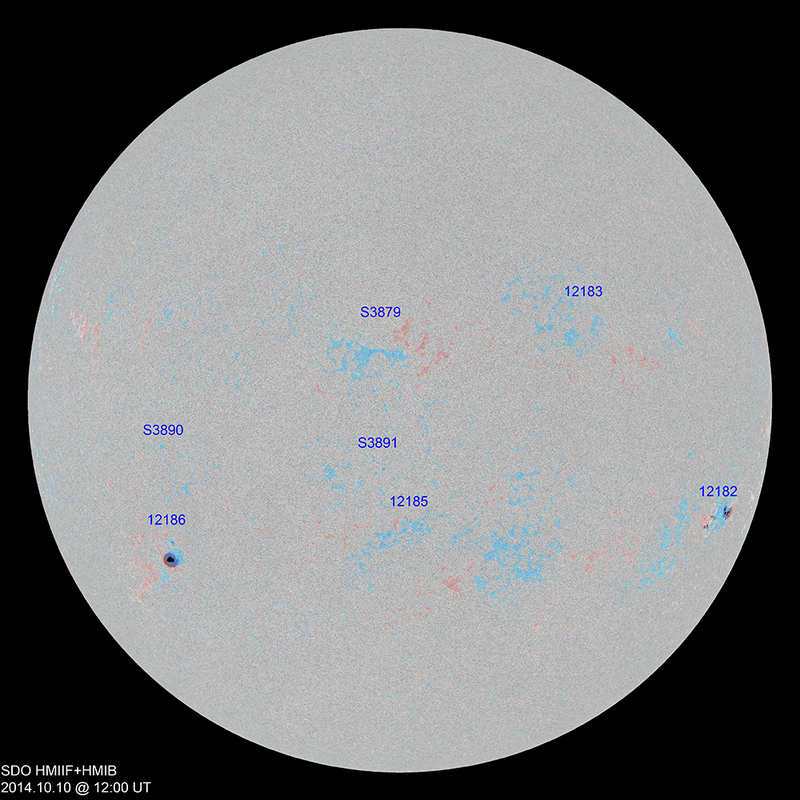 Here is today’s annotated sunspot, coronal hole and magnetic map (blue = N) from http://www.solen.org: This last is a blend of two different exposures of the same panel: I tried to do a zoom with a Barlow of the large sunspot but my focus wasnt really good enough. 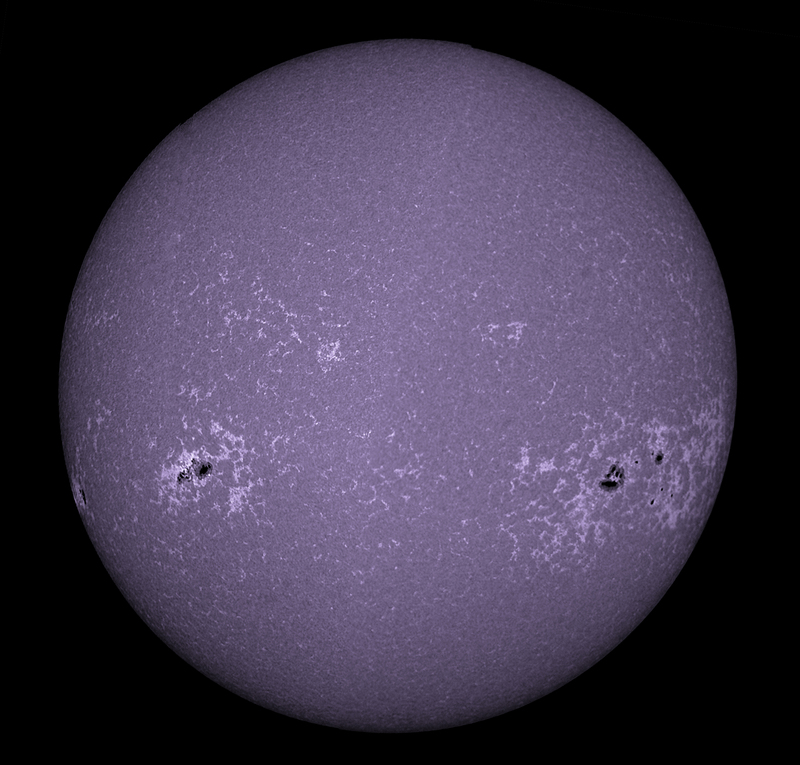 1000/102 refractor, Lunt B1200 CaK module, Baader K line filter, Skyris 274m CCD camera. Ioptron ZEQ25GT mount with Hinode autoguider. This is the sky just after my session.